Chuck Rock is a slapstick side-scrolling platform video game of the early to mid 1990s, which was initially created by Core Design in 1991 and was subsequently was ported to a large number of home consoles of the time over the next few years. Chuck Rock was both developed and published by Core Design in 1991 for the Atari ST and Amiga consoles, and a year after, in 1992, for the Commodore 64, and in 1994 for the Amiga CD32. The game was subsequently published by Krisalis Software for the Acorn Archimedes. Virgin Interactive published the game for the Sega Mega Drive/Genesis, Sega Master System, and the Sega Game Gear. Sony Imagesoft published the game for the Sega Mega CD, Nintendo SNES, and Nintendo Game Boy. In 1994, the game was among the most popular games for the Sega Mega Drive/Genesis. The character of Chuck Rock himself was an iconic early character for Core Design before the introduction of Lara Croft in the 1996 game Tomb Raider, and the character of Chuck Rock himself and his family even featured in some UK comic books of the 1990s. Chuck Rock spawned two other video game sequels. 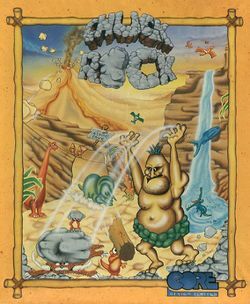 The setting of the game is a fantasy prehistorical Stone Age-era world that is shared by both neanderthals, woolly mammoth, saber tooth tigers, dinosaurs, and various assorted wild primeval monsters such as prehistoric mammals, giant insects, man-eating plants, and other exotica. One day, Ophelia Rock is kidnapped by the jealous local bully, a tyrannosaurus rex by the name of Garry Gritter (an obvious pun on the name of former disgraced pop star Gary Glitter) and carried off to Gritter's hang-out in the creepy dinosaur graveyard. Chuck must go to her rescue, searching for her in primeval jungles, swamps, lakes, an ice-capped mountain top, underground caves, and even the insides of a gigantic dinosaur. This page was last edited on 14 January 2012, at 00:28. This page has been accessed 5,294 times.